The Off-Road Direct solid axle conversion kit includes all the necessary brackets to convert an IFS (independent front suspension) to a solid axle setup. The solid axle design allows for taller lift heights, larger tires and increased articulation. 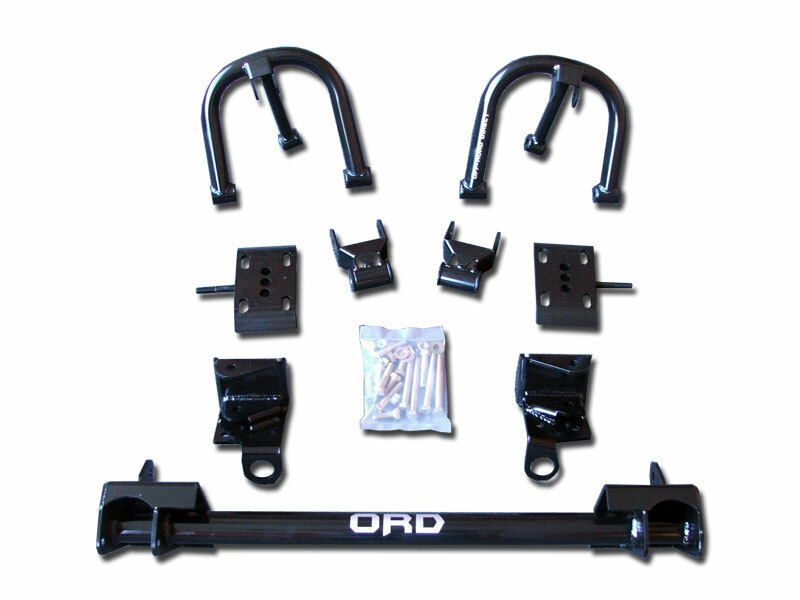 The solid axle conversion kit offers a modular design that bolts onto existing mounting points and frame rails. The kits can be easily installed and retains all factory capabilities. The Off-Road Direct conversion kits is a combination of innovative engineering and design that is performance driven. Shock hoops have been redesigned. The shock hoops are now weld-on. This allows for adjustability for different applications. 1. Cut brackets and clean frame. 2. Find best location for shock hoops. The support bar is long and can be cut to length for the proper fitment. You may also grind the legs of the hoops for proper fitment. 3. Lower shock tabs can be welded to spring plates is applicable. You may also grind tabs off of the shock tabs to weld them to the axle tube or other location for best fitment. 4. Properly weld tabs, hoops and support bars to desired location. *Kits DO NOT come powdercoated. Kit adds 5" of lift to leaf spring height. Complete bolt on kit, No welding. Uses 31.5" Spring pad width axles. Click the button below to add the 94-04 Chevy S10 Solid Axle Conversion (4wd) to your wish list.